Two of my favorite childhood recipes are my mother’s seafood paella and my grandmother’s bread pudding with lemon sauce. 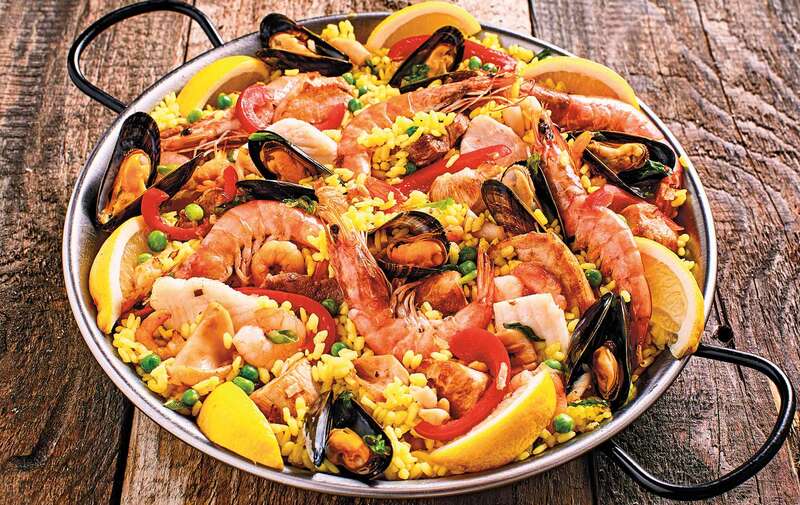 Paella is a wonderful meal to serve to a group. With its colors and textures, it is beautiful on the table, and the fragrant combination of seafood and saffron is heady. While this recipe calls for shrimp, mussels, and clams, it is possible to substitute other fish and shellfish that are fresh and available. A lobster tail or two makes a lovely addition to the pan. Be sure to use Spanish-style chorizo. It is a cured sausage, unlike the raw Mexican chorizo. And use a heavy, flat-bottomed cooking vessel. You can use a traditional paellera (a flat round pan with two handles), or do as I do and use a large cast-iron pan. The heavy pan will help you get that much-desired layer of crisp rice at the bottom; this caramelized crust, called the socarrat, is essential to great paella. Peel and devein the shrimp, reserving the heads and shells for the stock. Refrigerate the peeled shrimp until ready to use. Place heads and shells into a large stock pot. Add 5 cups of water to the stock pot. Add the small onion, tomato, 5 cloves of garlic, bay leaves, and saffron or seasoning. Add parsley as is, no need to cut it up. Add salt to taste. Add wine and simmer for 20 to 30 minutes. While your stock simmers, preheat the oven to 350 degrees. Heat the paella pan or skillet on medium on the stovetop and add the bacon. Cook at medium heat until the bacon is browned. Remove all but 3 tablespoons of the bacon fat from the pan. Add the large onion and sauté until it begins to soften. Add salt to taste. Add the garlic and sauté until it softens. Add the cured ham and chorizo and cook until it is warm. Add the rice and cook, stirring often, until it becomes translucent. Add 4 cups of the stock and simmer on the stovetop for 7 to 10 minutes until it is not soupy, but some liquid remains. Remove from heat. Add the shrimp, burying them into the rice as much as possible. Place mussels and clams into rice, tail end first. Distribute strips of pimiento on the top. Bake at 350 degrees for 30 minutes or until all stock is well absorbed. Remove from oven and cover loosely with foil until ready to serve. Serve with lemon wedges on the side, baby peas on top, and a dry Spanish red wine. ¡Buen provecho! I always follow any paella dinner with my grandmother’s bread pudding. This is not your typical heavy pudding with whiskey sauce; instead, it is light and airy from the Cuban bread. It bakes golden brown with a custardy, almost soufflé-like center and a crisp top from the drizzle of butter and sprinkling of sugar. Each bite of the pudding is faintly sweet, and it’s perfect topped with the bright lemon sauce. Somehow, I was the only one who learned this recipe from Meemaw, so I am the designated bread pudding maker for family gatherings. Preheat oven to 300 degrees. Lightly beat eggs and add 1/2 cup of the sugar, vanilla, and salt. Stir together until blended, then add milk and stir again. Tear bread into large pieces (you will probably only need about 3/4 of the loaf) and add to the milk mixture. Use just enough bread to absorb the milk while keeping the mixture moist and soupy. Stir in the raisins. Pour 4 ounces of the butter into a deep baking pan. Ladle the milk and bread mixture into the center of the pan and spread it to the sides. Drizzle the top with the remaining butter, sprinkle with the remaining sugar, and sprinkle with nutmeg to taste. Bake for 45 minutes to 1 hour. The pudding should be firm but still moist, and the top should have a golden crust. While the bread pudding is baking, make your lemon sauce. Stir water, sugar, and lemon juice together in a small saucepan. Bring to a boil, lower the heat, and allow to simmer for 10 minutes. Add the lemon zest, simmer for another 5 minutes, then remove from heat. 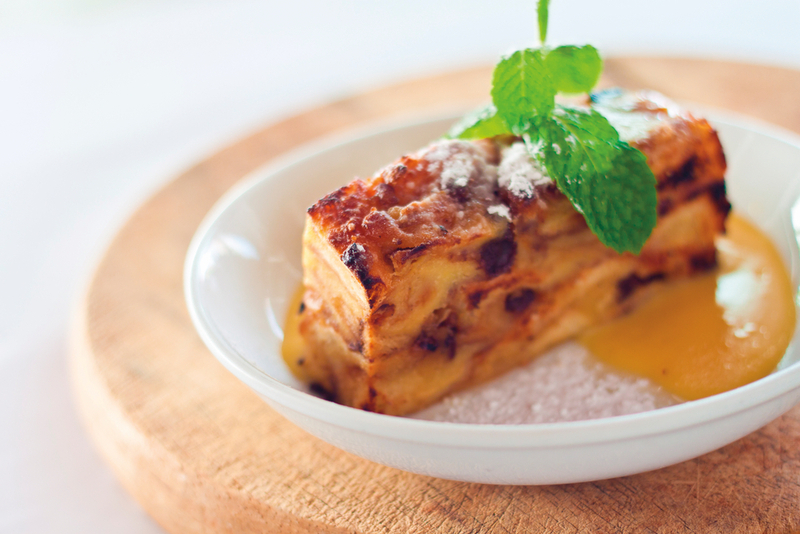 Serve bread pudding warm with lemon sauce drizzled over the top. Yum!